• Have all changes been saved? • File properly laid out and proofread? • File in CMYK format (not RGB)? • No .exe or .sea files. • Is your file expected? Please call BEFORE outputting this/these file(s). Please output a proof of my attached file, then call to discuss. I understand there is a $15.00 charge per file to output this proof. 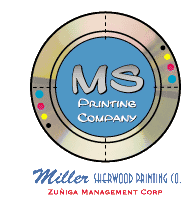 Miller Sherwood Printing is producing the layout and this/these file(s) are supporting or necessary file(s) for their use. Do nothing with this file, please wait for my phone call. Click on the "Browse" button below to select a file on your computer. Please use WinZip or DropStuff to compress the file before you send it, however, Sit-X files are not yet compatible with the transfer system. After you've selected the file, click the "Send File" to transfer your file to us. NOTE: The cost of outputting one (1) proof is $15.00, and when your project proceeds to production, this charge will be included in your order. If the project does not proceed to production, a separate $15.00 charge will be invoiced to your account. Once we output a proof if there are errors in your proof, we will notify you. Common errors are missing fonts, wrong number of ink colors, low resolution images, missing images, RGB images not converted to process colors - need help? Just call us.We can possibly make changes or fixes where needed at additional cost, or you may make the changes yourself and resubmit new files for $15.00 each. A new proof is required for each additional submission, before the project can be printed.